Collect available data about Airbnb tourism in different European locations. Asses the data quality and usability. Collect available data about traditional hotel tourism in corresponding European locations. Assess the data quality and usability. Assess comparability of the collected data and transform them to a comparable form. a) Airbnb establishment offer is expanding. b) The expansion pace does not significantly change over the time. c) Airbnb expansion does not significantly differ over European regions. d) Airbnb expansion is reaching such significant market share that it negatively influences hotel industry. Over the years, there were many start-up companies (example of such start-up companies is pronajmuse.cz or airdna.co.) established that built their business on helping people with renting their flats with Airbnb. One of the activities these companies do (except of advertising the place, cleaning, key exchange etc.) is estimating the optimal price daily. Therefore, they collect the data about all establishments, their prices and availability and suggest the most optimal price to their clients. Our data were collected from airdna.co. We obtained the data about hotel tourism from Eurostat. Potential issue with Eurostat data quality is that they are based on surveys and they are not always complete (some years are missing for some regions), however we consider this to be a minor issue as it occurs only in small amount of regions. From Eurostat, we gathered the data about tourists’ overnight stays. This side of Airbnb business is clearly not accessible – we can access only data about Airbnb offers, so Airbnb overnight stays can only be estimated. Our estimation is described in following chapters and is based on assumption, that structure of offered Airbnb establishments and their occupancy rate did not change significantly in time. 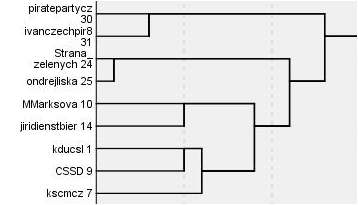 The gathered data from airdna.co and from Eurostat are of different regional granularity level. While Airbnb data are for cities (except of Crete and some other Mediterranean islands), Eurostat data are for NUTS2 regions. Therefore, from Eurostat we gathered data only for the cities from the NUTS2 region (they divide the data for cities/towns/rural areas) and from Airbnb we summed up statistics for the cities inside the region. We collected the data from 74 cities placed in 48 NUTS2 regions of 19 European countries. We divided the countries to four regions for comparison – West (Belgium, France, Netherlands, Austria, the United Kingdom, Germany), South (Spain, Portugal, Italy, Greece), East (Bulgaria, Hungary, Poland, Romania, Czech Republic, Slovakia) and North (Norway, Sweden, Finland). 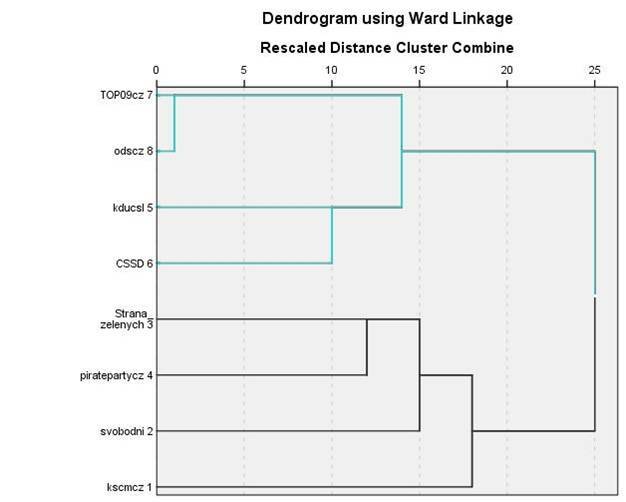 Figure 1 depicts the spread of the cities involved in the study and the regional division. Figure 1: Map of the cities involved in the study. Green, blue, red and yellow colors indicate the regions. Number of establishments (2012, 2013, 2014, 2015, 2016). Actual establishment size structure (Studio, 1 bedroom, 2 bedrooms, 3 bedrooms, 4+ bedrooms). 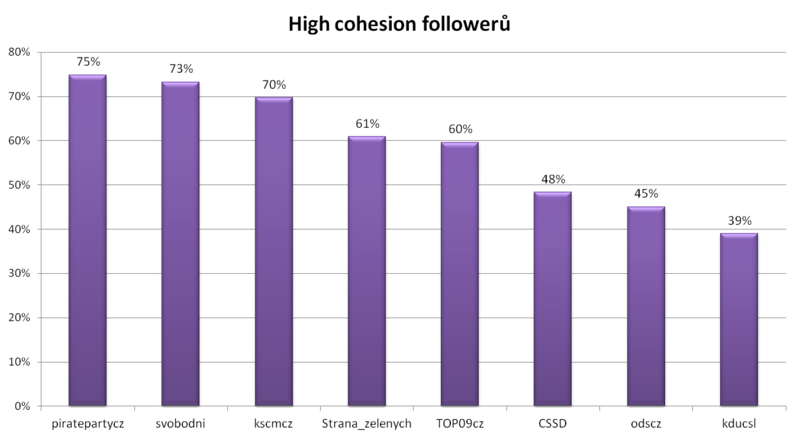 Actual occupancy rate (days rented in last year 30-90, 91-180, 181-270, 271-365). Hotels overnight stays (2012, 2013, 2014, 2015). To be able to estimate Airbnb market share for comparison with hotel industry, we had to assume, that structure of offered Airbnb establishments and their occupancy rate did not change significantly in time. Without this assumption, we would not be able to estimate Airbnb overnight stays in past years for comparison with hotel industry. We derived two estimations from available data – low and high and chose the optimal estimation in ⅓ distance between these two for reasons, mentioned below. Low estimation: Studio and 1 bedroom = 1 bed, 2 bedrooms = 2 beds, 3 bedrooms = 3 beds, 4 bedrooms = 4 beds, taking lowest day count from occupancy rate (30, 91, 181, 271), assuming occupancy rate in all types of flat are of uniform distribution. High estimation: Studio and 1 bedroom = 1,5 bed, 2 bedrooms = 3 beds, 3 bedrooms = 4,5 beds, 4 bedrooms = 6 beds, taking highest day count from occupancy rate (90, 180, 270, 365), assuming occupancy rate in all types of flat are of uniform distribution. Optimal estimation: In ⅓ distance between lower and higher, because bigger flat is usually not fully occupied (6-beds flat is usually not occupied by 6 people, but i.e. by smaller family). Second reason is that distribution of occupancy rate is decreasing, therefore more flats with occupancy rate 30-90 days in a year are occupied closer to 30 days than to 90 days. Calculating Airbnb between-year growth was based on establishment offer, as it reflects the growth (and overnight stays is only estimation assuming the structure did not change). Number of flats should correspond with number of tourists, as the supply-demand correspondence rate is very flexible in this case. Calculating hotel between-year growth was based on overnight stays, because establishment offer does not reflect change on the demand side (number of hotels and hotel rooms offered does not correspond with number of tourists). The results contain regions with the highest and lowest Airbnb growth rate, average Airbnb and hotel industry growth pace in the four regions and the estimation of Airbnb market share. 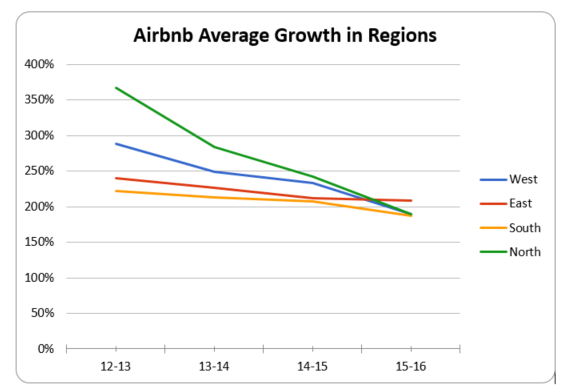 Table 1 and Table 2 list the regions with Airbnb highest and lowest growth speed. 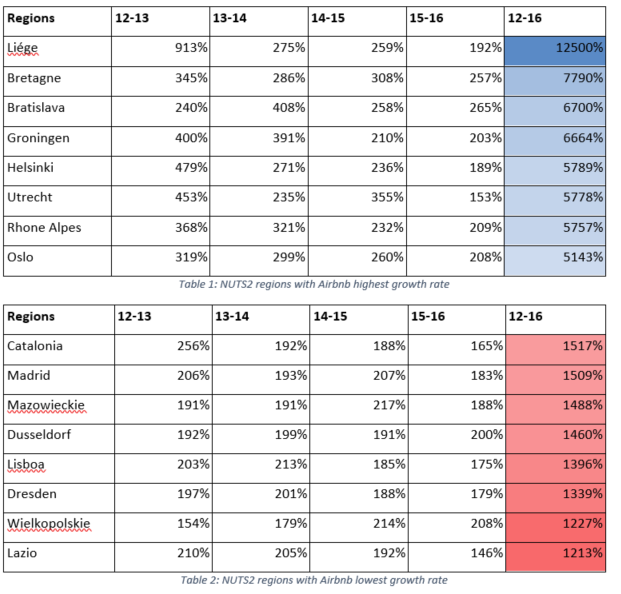 The important trend we can see in the tables is that the lowest growth rate regions include a significant amount of the South European regions. Our hypothesis is that the regions with a developed tourist market have a lower growth rate than regions with developing tourist market. These regions are growing faster because they are in a position farther from their maximum. In contrast, the developed tourist market is already operating, or closer, to the capacity frontier. It can be considered an analogy with economy – developing and developed countries. The growth speed is gradually decreasing in average and in all the regions. The quickest growth was in the Northern Europe in 2012, however the growth is significantly decreasing in all regions except the Eastern Europe. The Eastern Europe was the only region above 200 % growth speed between 2015 and 2016. The decreasing growth rate, as the years pass, indicates this market is maturing but still hasn’t achieved its maximum. The numbers are huge in comparison with any business company in this market. It must be considered as a profitable opportunity. 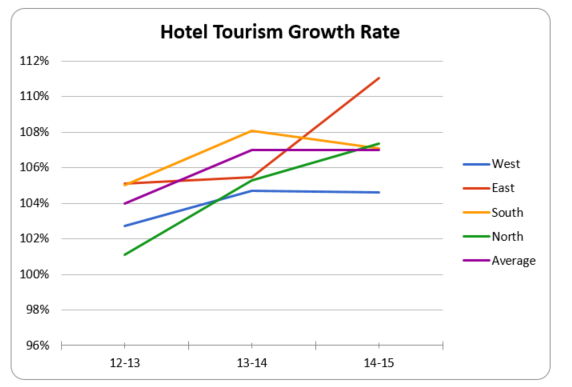 The hotel growth rate is stable, doesn’t change significantly in the last years, as depicted in Figure 3. It indicates it is a mature market. The quickest growth among the regions is in the Eastern Europe, however the differences between regions are much smaller than in the case of Airbnb. Estimated Airbnb market share in comparison to hotel industry is gradually growing and in 2017 it could reach 10 % in the Western and the Eastern Europe, while in the Southern and Northern Europe will probably not cross this threshold next year. Eurostat data have some years missing. Airbnb data reveal only part of the whole picture (offer side), demand side is airdna past extrapolation, corrected by sample data time-to-time issued by Airbnb itself. 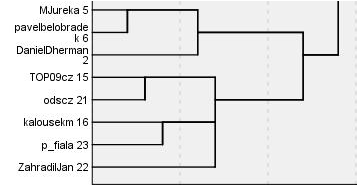 We had to create a mapping between NUTS2 region and cities to be able to compare the data. We had to do several assumptions and estimations about Airbnb data to be able to derive values, comparable to Eurostat data. The hypothesis was verified. Airbnb establishment offer is expanding in all regions contained in the study. The hypothesis was denied. Expansion pace is slowing down. We can see the quickest slow in the Northern and Western Europe. Thy hypothesis was denied. Initially the slowest growth was in the Southern and Eastern Europe. However, in the Western and Northern Europe the growth slowed down significantly. Extrapolating this trend, we can still expect significant growth in the Eastern Europe, but in the rest the market will reach its maximum in the nearest years. 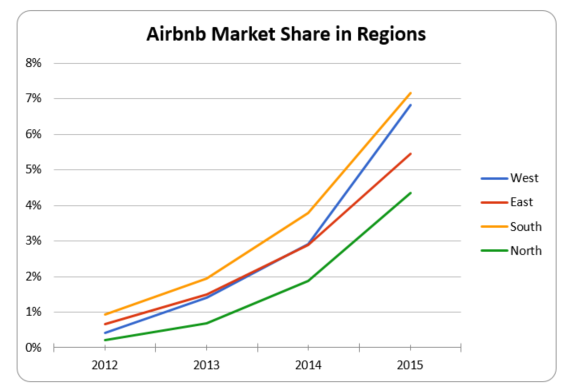 As we can expect estimated Airbnb market share to reach more than 10 % of market in 2017, it certainly has the potential to negatively influence hotel industry. However, hotel tourism is growing in stable pace since 2012, so we cannot affirm negative influence of Airbnb tourism. Moreover, the quickest growth of hotel tourism is in the Eastern Europe and there is now also the quickest growth of Airbnb tourism. So far it seems the Airbnb growth does not influence the hotel industry, however it can change if Airbnb does not lose its growth pace. Pro Stranu svobodných občanů jsem analyzoval výsledky krajských voleb v libereckém kraji. Měla na výsledek vliv kontaktní kampaň ve městě, známost jejich politiků, počet členů a příznivců z okolí, pojízdný billboard nebo něco úplně jiného? Jaké druhy akcí by strana pro příště měla lokálně pořádat a s jakou cílovou skupinou by měla dlouhodobě pracovat, aby dosáhla lepších výsledků? Time Deposit Propensity Modeling Dataset obsahuje údaje o 120 000 zákaznících bank. Cílovou proměnnou je údaj o tom, zda si zákazník otevřel termínovaný účet. Cílem analýzy je na základě dostupných údajů predikovat, kteří zákazníci si otevřou termínovaný účet. Pohlaví, věk (určen datem narození a referenčním datem), stav (ženatý/vdaná, rozvedený/á, svobodný/á…), počet dětí, pracovní pozice. Roční příjem, indikátor výplatního vztahu k bance, obchodního vztahu k bance. Účet, investiční produkty, pojištění, podnikatelská půjčka, hypotéka, spotřebitelská půjčka, kreditní karta. Výše účtu, výše financí v investičních produktech, výše financí v pojištění, výše podnikatelské půjčky, výše hypotéky, výše spotřebitelské půjčky, výše půjčky na kreditní kartě. Počet transakcí na pobočce, počet výběrů z ATM, počet APS transakcí, počet transakcí telefonem, počet transakcí přes internet, počet výběrů za měsíc, počet plateb za měsíc, počet převodů za měsíc. Objem zaplacených záloh za měsíc, objem výběrů, objem plateb, objem převodů. Počet splátek, počet plateb za měsíc, počet nákupů za měsíc, počet výběrů za měsíc, objem plateb za měsíc, objem nákupů za měsíc, objem výběrů za měsíc. Cílová proměnná – otevřel si klient termínovaný účet? Hodnoty atributů jsem v první fázi hodnotil pomocí filtrů v MS Excel, následně pomocí statistik v RapidMiner. Mohl jsem tak identifikovat nelogické, chybějící či podezřelé hodnoty. Nejzajímavější z tohoto hlediska mi přišly hodnoty zaměstnání „default“ (17 pozorování). Pravděpodobně se jedná o nevyplněnou hodnotu. Druhou zajímavostí je 25 pozorování se záporným ročním příjmem. Kdyby tato hodnota chyběla, doplnil bych ji (buď průměrem nebo na základě regresní analýzy). Vzhledem k tomu, že je to hodnota nejspíš chybná (a u většiny z těchto pozorování se také vyskytuje podezřelá kategorie zaměstnání „default“), rozhodl jsem se tato pozorování do analýzy nezařadit. Důvodem pro toto rozhodnutí je také to, že nemám jak zjistit, jak tato data vznikla, takže pokud by se v analýze ukázala jako významná, stejně bych neměl možnost je interpretovat. Odstranění podezřelých dat z analýzy by nemělo zkreslit výsledky, vzhledem k tomu, že se jedná pouze o 0,02 % dat. Nad daty jsem provedl následující výpočty a agregace. Sumarizaci počtu produktů u banky. Součet pozitivního zůstatku v bankovních produktech. Normalizaci objemu pozitivního zůstatku oproti celkovému pozitivnímu zůstatku podle druhu (poměr). Součet negativního zůstatku (půjčky, záporný zůstatek na kreditní kartě) v bankovních produktech. Normalizaci objemu negativního zůstatku oproti celkovému negativnímu zůstatku podle druhu (poměr). Sumarizaci celkového počtu měsíčních transakcí. Normalizaci objemu transakcí podle druhu. Sumarizaci celkové aktivity kreditní karty. Normalizaci objemu aktivit kreditní karty podle druhu. Normalizovaná data mají mnohem větší výpovědní hodnotu, než data původní, protože lépe rozdělují zákazníky podle jejich chování. Pro vysvětlení uvažujme zákazníky A, B, C s následujícími parametry transakčního objemu a kanálů, jimiž byl tento objem učiněn. Pokud bychom chtěli tyto tři zákazníky rozdělit do dvou shluků podle využití kanálu 2, na nenormalizovaných datech by v prvním shluku skončil zákazník A a ve druhém shluku zákazníci B a C. To je ovšem evidentně špatně, protože chování zákazníků A a B je shodné (kanálem 2 uskutečnili 20 % transakcí), zatímco chování zákazníka C je odlišné (kanálem 2 uskutečnil 60% transakcí). Třetina žen, dvě třetiny mužů. Průměrný věk 42 let, rozptyl věku 19-69 let. Nejvíc klientů je ženatých/vdaných (60 %) a single (30 %), zbylých 10 % je rozvedeno nebo ovdovělých. Průměr dětí klienta je 0,7, maximální počet dětí je 12. Podle druhu pracovního poměru je 56 % zaměstnanců, 17 % vlastníků firmy, nejméně je pak nezaměstnaných (5,2 %) a podnikatelů (3,5 %). Průměrný roční příjem je 44 744. Nejvíc klientů má tři bankovní produkty (průměr je 2,7). Průměr zůstatku na kladných produktech je 688 s vysokým rozptylem (1492), největší sumu mají klienti na běžném/spořicím účtu (71 %). Průměrný počet měsíčních transakcí je 3,75, průměrná částka je 927 za měsíc, rozptyl je 3572. Průměrná částka transferů kreditní kartou 208. Nedoplatky – více než 100 000 klientů nedlužilo vůbec, přes 3000 dluží celý rok. Nejdůležitější je rozdělení Time deposit flagu (1337 T, 118638 F), tedy termínovaný účet si otevřelo pouze 1,11 % klientů. Na tuto nevyváženost je zapotřebí si dát pozor při tvorbě klasifikačního modelu. Cílem je vytvořit model, který dokáže co nejlépe klasifikovat otevření termínovaného účtu, tedy dosáhnout maximální hodnoty parametru recall pro hodnotu cílového atributu True za současně co největší celkové přesnosti modelu. Recall je poměr TP predikcí a celkových pozitivních dat. Dataset rozdělím na trénovací a testovací data v poměru 70:30. Základní nastavení stromu nezafungovalo. Strom predikuje všem hodnotám false, což sice znamená prakticky 99% úspěšnost, ale recall cílové třídy je 0. Problémem je nevybalancovanost dat. Pokud jsou data nevybalancovaná, class recall se blíží celkovému zastoupení třídy v datech. Použil jsem tedy sampling tak, aby data byla vybalancovaná. Dále jsem změnil kritérium pro umisťování uzlů. Defaultní nastavení je information gain, který umisťuje uzly s minimální entropií. Má tedy tendenci vybírat atributy s velkým množstvím hodnot. Místo information gain použiji accuracy. Těmito dvěma kroky se predikční model podstatně zlepšil. Přesnost predikce cílové třídy je 64 %, recall 62,5 %. Samotný strom je vytvořen pouze na základě jednoho kritéria – celkové sumy na kladných bankovních produktech (účet, pojištění, investice). V případě rozhodování na základě více kritérií by se přesnost stromu mohla zlepšit. Zakážu tedy prepruning stromu a maximální hloubku stromu nastavím na 5. Přesnost i recall se nepatrně zlepšily. Další vylepšení modelu by mohlo spočívat v manuálním nastavení hodnot prepruningu či použití jiného druhu rozhodovacího stromu. Tento výsledek modelu však nyní považuji za dostatečný. Pro přehlednost byla vybrána pouze rozhodovací pravidla, určující třídu T.
Úspěšnost modelu je potřeba ověřit i na nenasamplovaných datech. Data jsem transformoval a normalizoval a na vyvážený vzorek dat jsem aplikoval algoritmus rozhodovacího stromu, který vybíral uzly podle přesnosti, neaplikoval prepruning a měl 5 úrovní. Tento strom dokázal z datasetu vybrat jednu třetinu klientů, mezi nimiž se nacházelo 70% klientů, kteří si otevřeli termínovaný vklad. Klienty, kteří nejvíce inklinují k otevření termínovaného vkladu, byli klienti s následujícími parametry: – Celkový finanční zůstatek na kladných produktech větší než 2721 dolarů; úspory na běžném či spořicím účtu tvoří více než 5% této částky; úspora na kreditní kartě je větší než 2% výše půjček. – Starší než 26 let; rozdíl zůstatku na kreditní kartě a půjček není větší než 6187 dolarů; poměr peněz na kreditní kartě a půjček je menší než 2,2 %. – Rozdíl zůstatku na kreditní kartě a v půjčkách není větší než 406 dolarů, platby z účtu tvoří méně než 1,8 % celkových transakcí, celkový roční příjem je větší než 78 000 dolarů, v kladných bankovních produktech mají méně než 500 dolarů. – V kladných bankovních produktech mají méně než 500 dolarů, celkový roční příjem je menší než 78 000 dolarů, ještě nemají žádný bankovní produkt (kromě běžného/spořicího účtu). – V kladných bankovních produktech mají méně než 500 dolarů, celkový roční příjem je menší než 78 000 dolarů, již mají nějaký bankovní produkt a jsou podnikatelé. Aplikace a další ladění modelů parametru by v praxi závisely na rozhodnutí managementu. Mým doporučením by bylo na klienty ve vytyčeném segmentu cílit marketing zaměřený na otevření termínovaného vkladu. Přesnost cílení se v každém případě pohybuje mezi 2 a 3 procenty, což je 2 – 2,5 krát větší přesnost, než pokud bychom model neaplikovali a cílili naslepo. Na rozhodnutí managementu by bylo, zda chtějí zacílit na větší skupinu potenciálních klientů i za cenu cílení na nepotenciální klienty. Pokud by tomu tak bylo, rozšíření rozhodovacího stromu o další patra by dokázalo tento požadavek splnit. Oslovení 45 000 klientů (výsledek stromu o 12 patrech) dokáže pokrýt 80% klientů se záměrem účet otevřít. Strany se na twitteru nedělí podle politických teorií (pravice/levice, konzervativní/liberální), ale spíše na protest/establishment (lze interpretovat i jako malé/velké s několika výjimkami). Při hledání odpovědí na politické otázky s využitím sociálních sítí nesmíme zapomenout na specifika podobných analýz. Prvním je fakt, že závěry nelze zobecnit na celou populaci, protože se nejedná o reprezentativní vzorek obyvatelstva. Na českém twitteru se nachází především nejmladší generace (70% uživatelů je mladších 30 let), městská, vzdělanější a mužská část populace (v Česku 70 % mužů a 30 % žen). Celkový počet českých uživatelů twitteru se pohybuje mezi 300 a 500 tisíci uživateli, konkrétní odhady se rozcházejí. Největší celebritou českého politického twitteru je s obrovskou převahou Andrej Babiš. Počet jeho followerů překonal letos na jaře 200 000. Babišovi a jeho PR týmu se navíc daří toto číslo konstantně navyšovat, od prosince 2015 získal více než 30 000 nových followerů. Odstup dalších politiků je značný. Oficiální účet Karla Schwarzenberga má lehce přes 30 000 followerů, které získal především během prezidentských voleb a od té doby se tento počet nemění. V první desítce co do počtu followerů najdeme třeba ještě Miroslava Kalouska, Bohuslava Sobotku, Pavla Bělobrádka, Petra Fialu či Jiřího Ovčáčka, který na twitteru podle vlastních slov oficiálně reprezentuje hrad. Nikdo z nich však nemá ani desetinu followerů Andreje Babiše. Reálný vliv twitterového účtu na společenské dění se však nedá měřit jen počtem followerů. V úvahu musíme vzít i cílovou skupinu, kterou politik na twitteru oslovuje. Zde je například mezi účty Andreje Babiše a Jiřího Ovčáčka markantní rozdíl. Zatímco Andrej Babiš cílí na „běžného uživatele“ podobně jako na facebooku, Ovčáček používá twitter více jako nástroj komunikace s médii, což zvyšuje citovanost i reálný dosah jeho účtu. Zatímco 89 % followerů Andreje Babiše nesleduje žádného jiného českého politika, u Jiřího Ovčáčka je to pouze 27 %. Cílem mé analýzy bylo vytvořit politickou mapu, která by znázorňovala, jak k sobě mají jednotliví politici blázko. Jedním ze základních ukazatelů blízkosti na sociálních sítích je podíl společných přátel (na facebooku) nebo followerů (na twitteru). Abych získal lépe vypovídající výsledky, vyřadil jsem z analýzy followery, u kterých se dá předpokládat profesní zájem o problematiku (novináři, pracovníci v PR a marketingu, političtí analytici apod.) a jejichž following nemůže být žádným způsobem vyjádřením politických sympatií nebo osobního zájmu. V případě českého twitteru se jedná o skupinu asi 3000 followerů, kteří sledují více než pět politických účtů napříč celým spektrem. Strany v tabulce jsem seřadil podle obecného chápání levice – pravice. Pokud by na Twitteru platilo, že se uživatelé dělí na tyto dva tábory, pak by tmavá část měla být podél diagonály (případně tmavá oblast vlevo nahoře a vpravo dole). To evidentně neplatí. Nejlepší řazení, které vytvořilo tmavý shluk vpravo dole, je vidět na dalším obrázku. Nejpravděpodobnější interpretace výsledku je taková, že strany establishmentu (ČSSD, ODS, TOP09, KDUČSL) navzájem sdílejí svůj potenciální elektorát, zatímco strany, které se prezentují jako protestní (Svobodní, Zelení, Piráti, KSČM), mají úzce vyhraněnou skupinu fanoušků, kterou s ostatními stranami nesdílejí. Úzké zaměření fanoušků protestních stran je vidět na tomto grafu. 70% followerů Svobodných, Pirátů a komunistů nesleduje žádnou jinou stranu, zatímco více než polovina fanoušků ČSSD, ODS a KDUČSL sleduje i jiné strany. Výsledky, viditelné v matici blízkostí, jsou potvrzeny i hierarchickým shlukováním. Všimněme si, že strom se u protestních stran spojuje mnohem výše, než u stran establishmentu. To opět potvrzuje silné propojení fanoušků establishmentových stran a úzké zaměření fanoušků stran protestních. Metoda vícerozměrného škálování vytváří 2D mapu, která je ovšem méně přesná, než zobrazení ve stromu hierarchického shlukování. Dává však velmi podobné výsledky, jako předchozí metoda. 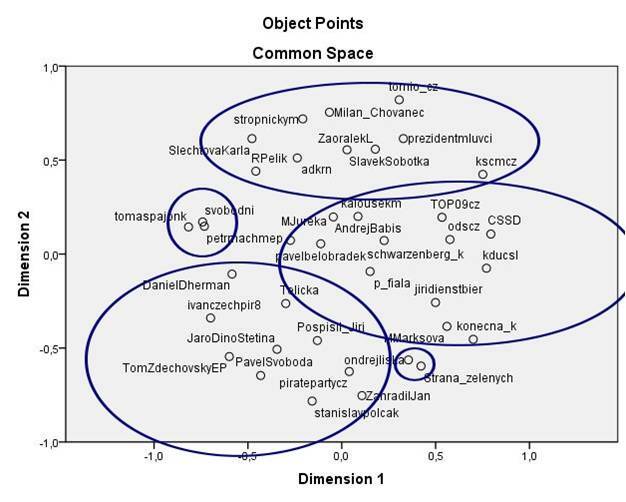 Cílem experimentu bylo porovnat jednoduchý (akademický Lexicoder) a sofistikovaný (komerční Semantria od Lexalytics) nástroj na analýzu sentimentu. 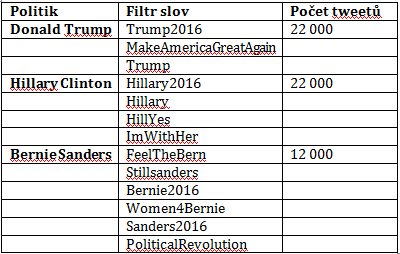 Samotnou analýzu jsem dělal nad tweety o Donaldu Trumpovi, Hillary Clinton a Bernie Sandersovi (květen 2016). Lexicoder vrátil na tweetech jasné souhrnné výsledky, které však postrádají podrobnost. Hillary a Bernie mají celkově pozitivní sentiment tweetů (+5%), zatímco Donald negativní (-3%). Tweety o Berniem jsou však celkově o něco méně emocionálně zabarvené než tweety o Donaldovi a Hillary. Semantria od Lexalytics se ukázala nevhodnou pro tento typ datasetu. je studie stanovisek, citů, subjektivity, postojů, hodnocení, dojmů, názorů a emocí vyjádřených v textu. Datovým zdrojem může být jakýkoli dokument, pro praktické použití jsou používané především uživatelské recenze, diskusní příspěvky, zprávy, komentáře či příspěvky na sociálních sítích (twitter, facebook). Dolování nalezených názorů může probíhat buď na úrovni jednotlivých částí textu (dokument, odstavec, věta) nebo na úrovni aspektů, kdy přiřazujeme sentiment určitým entitám v textu. Dolování sentimentu souhrnně z částí textu je založené na jednoduchém principu. Text předzpracujeme na jednotlivé tokeny. Ty pak porovnáváme se slovníkem pozitivních a negativních výrazů pro danou doménu. Celkové zabarvení textu je pak dáno poměrem pozitivních a negativních výrazů. Touto technikou lze určit nejen pozitivitu/negativitu dokumentu, ale i jeho subjektivitu (poměr součtu pozitivních a negativních výrazů vůči celkovému rozsahu dokumentu). Výsledky této metody lze zpřesnit v zásadě trojím způsobem: 1. Použít kvalitnější slovník, lépe přizpůsobený pro danou doménu. 2. Ve slovníku definovat váhy výrazů (např. nedobrý -> špatný -> příšerný). 3. Uvažovat i kontext výrazu a zesilující/zeslabující slova (velmi, opravdu, moc, příliš). Pro lepší představu uvažujme příklad recenze mobilního telefonu. Úkolem je nestrukturovaný text strukturovat. Prvním krokem je z textu extrahovat entity a stromovou strukturu jejich aspektů, kterým následně přiřazujeme konkrétní sentiment. V našem příkladu je entitou (kořenovým elementem stromu aspektů) mobilní telefon. První úrovní aspektů může být např. fotoaparát a baterie, listy pak čočka a kvalita fotografií s bleskem (pro rodičovský uzel fotoaparát), respektive velikost baterie a výdrž baterie (pro rodičovský uzel baterie). Strukturování textu potom spočívá v extrakci uspořádaných pětic informací: (entita, aspekt, sentiment, zdroj názoru, čas názoru). V našem případě taková pětice může vypadat následovně (iPhone 6, obrazovka, +, mobilmania.cz, 12. 5. 2016). V případě politické domény by to například bylo (Donald Trump, vztah k ženám, -, tweet, 12.5.2016). Vytváření těchto vektorů využívá mnoho známých postupů text miningu. Entity jsou rozpoznávány pomocí NER (rozpoznávání pojmenovaných entit), aspekty pomocí IE (extrakce informací), sentiment pomocí SI (identifikace sentimentu), zdroj a čas názoru potom pomocí DE (extrakce dat). Vytváření těchto vektorů se také potýká s klasickými problémy text miningu jako je řešení koreferencí, problém synonym apod. Pro úspěch je klíčovým faktorem znalost domény a přizpůsobení modelu této doméně. Při použití dat z twitteru je vždy potřeba pamatovat na jejich specifické vlastnosti. Prvním rysem je, že obsahují mnoho zkratek, hovorových a nespisovných výrazů a překlepů, což znamená větší nároky na přípravu slovníku. Druhou zvláštností, která se projevila na mém datasetu, je fakt, že nelze vždy s přesností určit, o kom přesně tweet pojednává, protože ve 140 znacích často chybí slovesa a označeno v něm bývá více kandidátů. Tweetů, kde je označen víc než jeden kandidát, byla v mém datasetu téměř třetina (největší průnik měl pochopitelně Donald Trump a Hillary Clinton). Tyto tweety jsem tak přiřadil k oběma kandidátům. Z hlediska výše popsaných algoritmů se jedná o nejjednodušší dolování sentimentu na úrovni celého dokumentu bez vah výrazů. Výsledky zpracování sentimentu nejsou překvapující. Hillary Clinton a Bernie Sanders mají celkově pozitivní sentiment, zatímco Donald Trump negativní, Tyto výsledky podle mě dobře odpovídají jejich mediálnímu obrazu. Zajímavým zjištěním je, že tweety o Hillary Clinton a Donaldu Trumpovi jsou přibližně o pětinu emocionálněji zabarvené než tweety o Berniem Sandersovi. Komerční program Semantria od Lexalytics funguje jako add-in do programu MS Excel. Nabízí mnohem větší škálu možností – z těch nejčastěji používaných je to, kromě analýzy sentimentu, generování frází, analýza slov, extrakce záměrů, entit, témat, aspektů, generování automatického shrnutí dokumentů, word-cloudů, asociačních pravidel a další. Pro výpočet sentimentu tweetů jsem tweety sloučil do celků o cca 2000 znacích, což je maximální délka dokumentu v trial verzi Semantria. Například generování summary ze stoznakového tweetu mi nedává logicky smysl, proto mě zajímalo, jak se Semantria vypořádá s dokumentem, tvořeným více tweety. Shrnutí odstavce: Sanders je mnohem rebelštějším kandidátem než kterýkoli demokrat před ním. To je důvod, proč tak ohrozil její vítězství v primárkách („korunovaci kandidátem Demokratů“). Sentiment odstavce a entit: Celkový sentiment odstavce byl označen jako mírně negativní. Z extrahovaných témat byl záporný sentiment přiřazen výrazu „dead heat“ a kladný výrazu „resilient“, sentiment ostatních témat je neutrální. Extrakci témat hodnotím spíš jako neúspěšnou. Dle mého názoru by měly být tématem odstavce slova: Sanders, Clinton, polling, lukewarm support. Ani v dalších odstavcích se mi extrahovaná témata nezdají vždy správná. U jednodušších případů je však určení sentimentu témat evidentně správné, u složitějších pak rozporné.